Cool Cruisers of Texas has created this privacy statement in order to demonstrate our firm commitment to privacy. The following discloses our information gathering and dissemination practices for the Cool Cruisers of Texas web sites. We use your IP address to help diagnose problems with our server, and to administer our web sites. Your IP address is used to help identify you and your shopping cart and to gather broad demographic information. This site contains links to other sites. 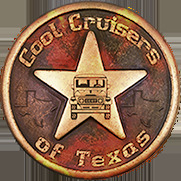 Cool Cruisers of Texas is not responsible for the privacy practices or the content of such Web sites.